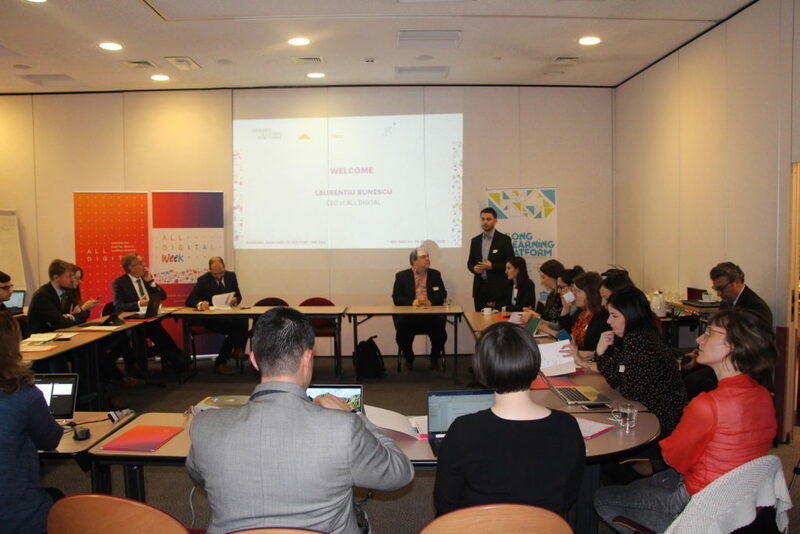 On 26 March, the Lifelong Learning Platform and ALL DIGITAL gathered European stakeholders to tackle the burning issue of digital skills and media literacy. Striking data lays before our eyes: 43% of European citizens lack digital skills to be able to fully participate in and benefit from the digital society. How do we work together to support them? This was the key question that representatives of EU institutions, civil society organisations, education institutions and practitioners came together to discuss as part of the ALL DIGITAL Week. Looking at the complex picture behind the figure of 43% as an EU average was a recurring theme of the day. Big cleavages are evident between countries (especially on the North-South and West-East divides) as well as within countries between rural and urban areas. Adapting efforts to address this diversity was a message shared by several speakers. Considering digital skills within the broader view of social inclusion was also a pivotal point of the debate. Ilona Kish from Public Libraries 2030 recalled that it is not just a question of digital skills themselves but about “how we live and work together in the digital shift”. Rodrigo Ballester, from the Cabinet of Commissioner Navracsics, stressed that beyond skills mismatches we need to think about inclusion and “digital citizenship”: this includes the promotion of critical thinking and media literacy skills in all sectors of education. He underlined that in many cases young people may perceive themselves as digitally “confident” but are not digitally “competent”, and this strikes an important difference. The Digital Competence Framework can indeed be a starting point, as Yves Punie, from the Joint Research Centre of the European Commission, pointed out: it identifies the main components of digital competencies and break them down to deliver the framework of what is needed in European societies. Lara Orlandi, from DG CONNECT, further built on this statement to explain that the concept of media literacy has now entered the common discourse in Europe and is indeed at the centre of institutional concerns. Other panellists like Andras Szucs, from the European Distance and E-learning Network, and Fiona Fanning, Certiport, stressed the need to improve our system of digital learning by starting to promote policy and practice across the whole of Europe and beyond. Young people may perceive themselves as digitally “confident” but are not digitally “competent”, and this strikes an important difference. These projects showcased the important work being done by stakeholders on the ground. The internal WG of the LLLPlatform on Digital Learning took place right after the event to reflect upon its outcomes. LLLP members discussed the ways to integrate such inputs into the internal work plan of the WG, and a few pillars were underlined; among these: a renewed focus on accessibility and inclusiveness, mobility learning schemes on digital skills (including KA1 projects), a deeper focus on employment and employers, a horizontal cooperation in EU projects, and stronger links – and actions – with formal education systems. The WG meeting was followed by a Focus Group on the preliminary results of the DIMELI4AC project, of which the LLLPlatform is a partner. The project intends to accompany students in the development of their digital media literacy (DML) and critical thinking skills with the support of their teachers and parents. Participants of the Focus Group were presented with the results of three targeted surveys on DML and offered precious insights that will feed into the next steps of the project. What’s next for media literacy and digital skills? The LLLPlatform will keep on working to ensure they remain as inclusive as possible and that digital tools contribute to closing the gap, rather than widen it. More on the principles that guide our actions here.